I have just read one of the best children’s books ever, that teaches the simple truths of the Bible. Here are 17 lyrical stories—from the point of view of the ANIMALS—with large, bright, happy artwork. Silliness and rhymes pop in and out of the humorous tales like little gophers. These tales can be enjoyed by children up to age 12 (and childlike adults), and are perfect to read aloud to children six and under. Once I started reading, I couldn’t put the book down. I smiled my way all through the stories, starting with the very first raccoon ever created, not knowing where he was or who he was, to the rooster that crowed at Peter’s denial of Jesus but soon finds something wonderful to celebrate. One of my favorites was the military group of Raven Raiders, a tactical organization that gets orders to feed Elijah. Children who read or hear these stories will later recognize them as they read the Biblical accounts from people’s point of view. This is one of my gems from a used book sale. This 220-page hardback is illustrated by Elizabeth Hagler, published in 1990 by Questar Publishers, and readily available online. 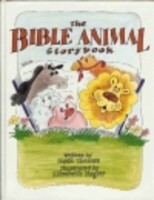 The Bible Animal Storybook is a keeper!